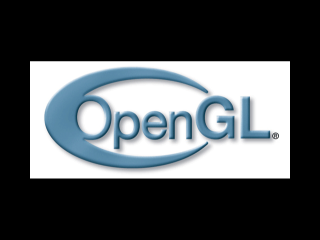 Using with glBegin()/glEnd() with glVertex() (known as immediate mode rendering) is deprecated in modern OpenGL implementations. If you want to render a textured polygon in modern OpenGL implementations, you're going to have to do it with VBOs. Here we have a new file with a new data type. An LTexCoord is a data type we're going to use to make handling texture coordinates easier. Each one of the vertices for our textured quad has a vertex position and a texture coordinate, so we have another file with another data type to put them together. Each one of our textured quad corners will be represented by a LVertexData2D object. We have new member variables for our VBO and IBO. We also have the new functions initVBO() and freeVBO() handle our VBO variables. As always, don't forget to initialize your variables. Here's our VBO initializer. Notice how it will only run if a texture is already loaded. There's no point in a textured VBO with no texture. First we declare our vertex data and index data we're going to send to the GPU. Then we set our indices. The reason we aren't setting our vertex data is because it's going to be set in the rendering function. The reason we're using "GL_DYNAMIC_DRAW" is because we're going to be updating the vertex data, as opposed to the previous tutorial where we sent the data once and reused it. As with previous the tutorial, we generate the buffers and send the data to them. After our buffers are created, we unbind the buffers. We call our VBO initializer whenever we load a texture so the VBO is ready to use for rendering our textured quad. As you can see, the rest of our texture loading is the same as before. The only part our VBO is going to affect is how the textured quad is rendered. At the top of the LTexture render() function, our vertex and texture coordinate calculation is pretty much the same as when we used immediate mode. The data itself isn't changing, it's how it's being sent to the GPU that's changing. After calculating our texture coordinates and vertex coordinates, we set the data in the vertex data array. 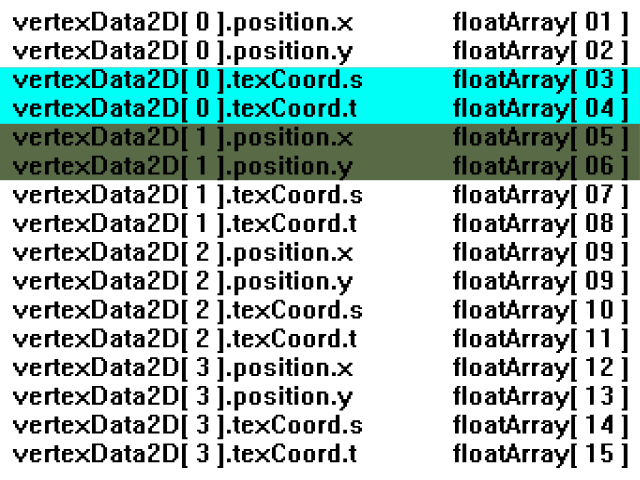 If any of you are confused why the vertex data is set like this, this code should actually look familiar. 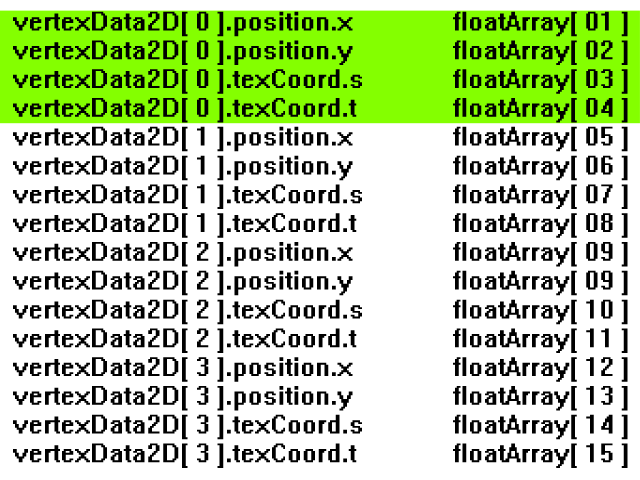 We're just specifying the same vertex/texture coordinates as we did before, only now the data is being put in an array. After setting our vertex/texture coordinates, it's time to render our textured quad. 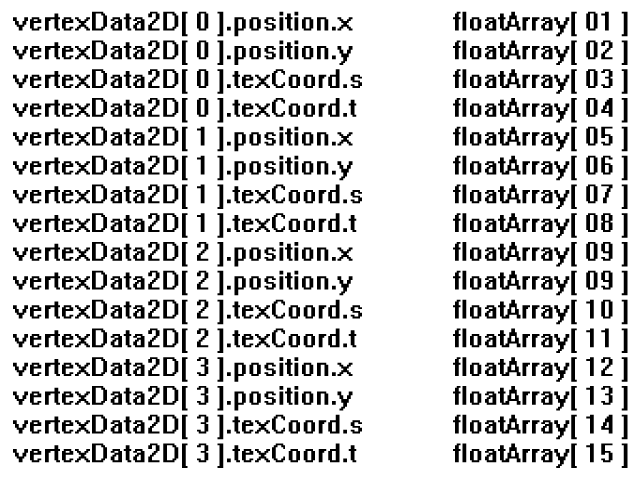 To do that we have to bind our texture, enable vertex coordinate arrays with "GL_VERTEX_ARRAY" and also enable texture coordinate arrays with "GL_TEXTURE_COORD_ARRAY". Before we can render our textured quad, we need to update the vertex data in the VBO with the vertex data we calculated at the top of the render() function. First we bind the VBO so we can do operations on it. Then we call glBufferSubData() to update the vertex data on the current VBO much in the same way you would use glTexSubImage2D() to update a texture. The first argument specifies what type of data you're updating. The second argument is the byte offset you want to start updating the data, and because we're updating the whole VBO, we start from the beginning address 0. The third argument is the size of the data you're updating in bytes. We're sending 4 LVertexData2Ds, so it's 4 times the size of a LVertexData2D. The last argument is the pointer to the vertex data. We have to set the vertex pointer like we did last time, and now we have to set the texture coordinate pointer since we're texturing. As with immediate mode, you want to send your texture coordinates before your vertex coordinates. Because we have our vertex coordinates and texture coordinates in the same VBO, setting the pointers is a bit more involved. The first argument for the glPointer functions is how many axes per coordinate. The second argument is the data type for the pointer data. The third argument is the stride. Using the offsetof macro, we can give the vertex and texture coordinate pointers different starting address. 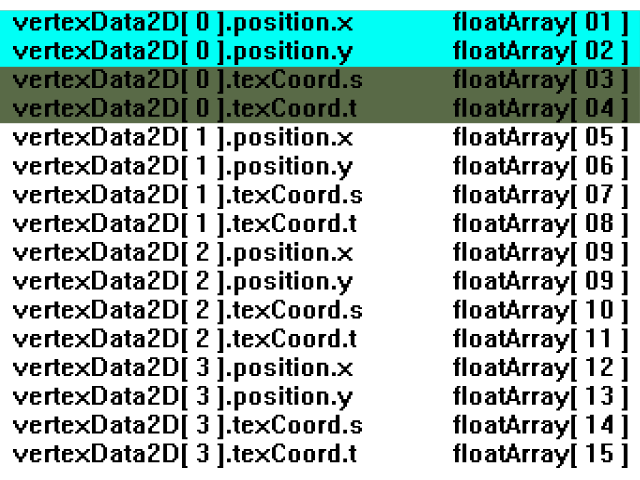 When we define the last argument of the glPointer functions, the starting address of the data, we give it the byte offset of the member within the LVertexData2D struct. Remember: we have a VBO bound, so any address we give the function is going to be retrieved from VBO memory. With our vertex coordinate and texture coordinate data set, we bind our IBO and render our textured VBO quad. You may be wondering why didn't we update the IBO the same way we updated our VBO. Remember that our IBO is set so we render 4 vertices in order. While our vertex data may change, the fact that we will render 4 vertices in order will not change. After we're done rendering our VBO textured quad, we disable the vertex and texture coordinate arrays. When we're done with our VBO and IBO, we free them using glDeleteBuffers(). We don't free the VBO when we free the texture. It could happen where we load one texture and then another. In this case we can reuse the VBO from texture to texture. We free the VBO after the LTexture object itself is deallocated. As you can see, all these VBO operations are invisible outside of the class.